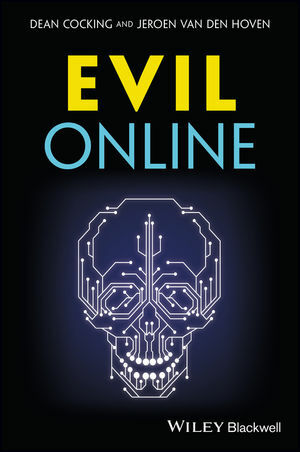 "I am delighted to offer my highest praise to Dean Cocking and Jeroen van den Hoven's brilliant new book, Evil Online. The confrontation between good and evil occupies a central place in the challenges facing our human nature, and this creative investigation into the spread of evil by means of all-powerful new technologies raises fundamental questions about our morality and values. Cocking and Van den Hoven's account of the moral fog of evil forces us to face both the demons within each of us as well as the demons all around us. In the end, we are all enriched by their perceptive analyses." "The internet offers new and deeply concerning opportunities for immorality, much of it shocking and extreme. This volume explains with great insight and clarity the corrupting nature of the internet and the moral confusion it has produced. It will play a vital role in the growing debate about how to balance the benefits of the internet against the risks it poses to all of us. Evil Online is an excellent book." We now live in an era defined by the ubiquity of the internet. From our everyday engagement with social media to trolls on forums and the emergence of the dark web, the internet is a space characterized by unreality, isolation, anonymity, objectification, and rampant self-obsession—the perfect breeding ground for new, unprecedented manifestations of evil. Evil Online is the first comprehensive analysis of evil and moral character in relation to our increasingly online lives. Chapters consider traditional ideas around the phenomenon of evil in moral philosophy and explore how the dawn of the internet has presented unprecedented challenges to older theoretical approaches. Cocking and Van den Hoven propose that a growing sense of moral confusion—moral fog—pushes otherwise ordinary, normal people toward evildoing, and that values basic to moral life such as autonomy, intimacy, trust, and privacy are put at risk by online platforms and new technologies. This new theory of evildoing offers fresh insight into the moral character of the individual, and opens the way for a burgeoning new area of social thought. A comprehensive analysis of an emerging and disturbing social phenomenon, Evil Online examines the morally troubling aspects of the internet in our society. Written not only for academics in the fields of philosophy, psychology, information science, and social science, Evil Online is accessible and compelling reading for anyone interested in understanding the emergence of evil in our digitally-dominated world. DEAN COCKING is a moral philosopher and independent researcher who works on friendship, moral theory, and various subjects within professional and applied ethics. He is the author of Virtue Ethics and Professional Roles (with Justin Oakley, 2001) and has published articles in Ethics, The Journal of Philosophy, and Revue Internationale De Philosophie. JEROEN VAN DEN HOVEN is Professor of Ethics and Technology at Delft University of Technology. He is founding editor-in-chief of Ethics and Information Technology and a member of the European Group on Ethics in the European Commission. He has been widely published on ethics and information technology, including Information Technology and Moral Philosophy (2009) and Designing in Ethics (2018). "I see Evil Online as in the same tradition as Hannah Arendt’s crucially important book The Banality of Evil, which attempted to explain and characterize the behaviour of apparently ‘ordinary’ people – rather than probable psychopaths like Himmler – in the Holocaust. As Cocking and van den Hoven note, whether their idea of a moral fog is a development of the banality thesis or something entirely new doesn’t matter much, since even if it is a development they are taking it further and using the idea of a moral fog to elucidate the way that the online environment we are in can make us insensitive to moral facts we’re otherwise perfectly capable of recognizing. Certainly the particular mechanisms of totalitarianism identified by Arendt aren’t straightforwardly going to explain evil online, but the general issues at stake do have similarities. How is it that Eichmann and the non-psychopathic perpetrators of evil online come to ignore their duty, or arrive at such a distorted view of what duty requires? The book is also in some ways analogous to Thomas Hobbes’s Leviathan, first published in 1651, in which Hobbes tries to explain how the natural state of human beings is amoral – a war of all against all – and how morality can be seen as a human creation enabling us to escape that state and build a civilization. The online world is something like a state of nature, but the difference between the Hobbesian situation and our own is that we already have a morality. The puzzle is how to disperse the fog, and it is a puzzle we need urgently to think about before it is too late and the fog begins to thicken and drift even further than it is already doing from the online into the real world."